In this edition of the X-Universe News we would like to show you a few pictures of just one single module of a much larger factory complex. The module you see is an ore refining module. It receives unrefined ore and processes it into refined metals. The raw materials for this module (ore rock) can come from different sources and you as a player can play a very active role in this, if you like. But that’s perhaps another story for a later issue of X-Universe News. The station module you see here is not small. It is exactly 1900m long in fact. But what you see here is still just one small module inside a station complex that can be much much bigger. 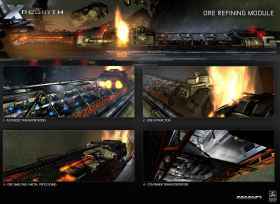 X Rebirth will allow you to build many different types of station. Many of them can eventually be expanded to contain an ore refining module. That’s when you will have one (or more) of these production lines visible in your station. The result is that you can see precisely what’s going on inside your mega complex. Is it producing right at this moment? Well you can ask the manager who helps you run the station, or you can just fly past it and see for yourself. Hi, I'm Metalvenom (Richard, to my mother) and you may well have seen one or more of the video trailers that I've been fortunate enough to make for Egosoft and even some of my other works. I'd like to try and give you a brief and rough insight into how I create a video, so maybe you can try yourself. To make life easier in creating scenes, go get yourself Cycrow's cheat package from here. With this cheat package you can spawn ships, clear sectors and warp yourself around the universe with ease. To record your game footage, I recommend Fraps (www.fraps.com) this is a pay-to-use program but there are plenty of free game recorders out there like xfire gamecam, for example. Once in game it's best to start as a neutral character, as you don't want any bounty hunters after you or any of the main races trying to kill you. The cheat package is easy to use and gives you the tools to create specific scenes within the X3TC game. For example, you want to have two destroyers face off against each other. Easy! Clear the sector of everything using the destroy sector menu in the cheat package. Next spawn the M2 ships you want to fight, make one the ships your own and spawn the other ship under the control of the Xenon. In this way, the Xenon-controlled ship will start to attack your ship. Then it's just a simple case of ordering your M2 to attack the Xenon M2. If you like, you can turn GOD mode on for both ships; they will not kill each other too quickly this way, therefore giving you time to record your epic battle at your own pace. Be sure to make your own ship have GOD mode turned on otherwise that Xenon destroyer is going to finish you off pretty quickly. The best ship to use for recording is something like the Spitfyre; it does not have a nose visible in the forward view that would otherwise spoil your footage. To create a film-style look with your footage, install the Video Enhancement Goggles and record with a small zoom. This brings out the detail on whatever you are focusing your shot on, although it's very tricky to keep track of fast-moving targets. The strafe keys are going to be your best friends when recording. You use these keys to strafe past ships or stations giving you some really good movie-like footage. Now you may find that the blue mouse cursor gets in the way of your footage. There is a way of removing this, however! Once this modification has been done, navigating menus with the mouse is no longer an option and can only be done via the arrow keys on your keyboard. So please be warned and use this only at your own risk. Get the program X3 Editor 2 here. Open the 01.cat file and find the line "objects\effects\menugfx\GUI\gui_master.pbd" and rename it to "objects\effects\menugfx\GUI\gui_master1.pbd", basically just putting a "1" in the name. This will remove the cursor and to bring it back, just simply remove the "1"; simples. Editor's note: Well done to Metalvenom for the Nautilus trailer you may have seen on April 1st. Thanks also to Ketraar, X2-Illuminatus and Iifrit Tambuur-san for their assistance with it. A big and dark universe. A mission offered by a little Boron, a huge, unknown station among the dangerous Xenon sectors, and a hero who is willing to confront the tasks and dangers. What sounds like the basis of a good science fiction story is indeed the plot of the German X-movie project VAGABUND by arragon0815. In addition to his role as director, producer, cameraman and scriptwriter, he also plays the leading acting role in the movie. Despite upcoming shooting dates and many appointments arragon0815 was willing to answer some questions from me about the movie. Many players already dreamed about a real X-Movie. What was your inspiration to make this movie? It started in X3: Reunion times. Back then I had so many ships, stations and so much tediousness that I tried to conquer and maintain a Kha'ak sector. Therefore I made some in-game recordings; I filmed my screen with my video camera, to proof my conquest later. I had so much fun while filming that I decided to make a complete movie. As 'Die Vergeltung' (The Retaliation) went down so well with the public (someone even created a homepage - I won't mention any names), and I had made myself familiar with the game's Installation - like where I find video and sound files - I was in the mood to go on filming. In the meantime I had got a better computer, which enabled me to use fraps and increased the movie's quality to HD. I also got a good video editing program, which made it possible to record chroma-key. That's a standard technology, which is used in the movie and television industry. You record something in front of a single-coloured background and replace it with whatever you like, in my case with game scenes. Equipped with such tools it was obvious to try them out, meaning to film myself and get me into that movie. All it needed now was a story. As I had finished the HUB-Plot at that time, I thought that this could be the basis for a good story. Of course, the plot won't be solved as the players can do it in the game. That would probably be too boring. In the movie you're playing the leading role. Therefore the viewer can see you as a person. Would you please describe the technology involved and how you went about filming and creating the movie? I already said something about the technology above, but to make it clearer, I will answer in a little bit more detail. You film yourself in front of a single-coloured background. This shouldn't have any colour that you're wearing. After I changed from white to blue I finally achieved the best results with green. Tip: Use green backgrounds!! Now you import the recordings into the video-editing program. There you can replace the green background with X-Game scenes. These recordings of the X-Games, in this case X3: Terran Conflict, are usually adapted, as well. I built windows into the Magnetar in places, where they aren't in the game, but where I needed them for the movie to play a plot. Also the other characters were cut out from the little communication videos that you normally see in the top right corner of the screen in the game, and were hopefully put together lip-synched. Afterwards everything was pasted together in my video-editing program. Sometimes six video tracks are used at the same time and rearranged until it fits. Then I took the soundtrack, edited it in another music-editing program, cut it short, built loops, did a few other things and imported it finally into the video-editing program. There it got the final touches according to the accompanying movie scenes, sometimes with four music tracks. You can imagine how work intensive this can be! Another interesting feature is the dialogue between the characters. How did you create them? When the basic plot was finished, I had to work on the details. I listened to nearly 14 hours of X3: Terran Conflict's sound files, cut out and saved the single pieces and was then able to create the certain characters. You basically have to put the dialogues together and use some own voice recordings. That's it. As mentioned before, you're solely responsible for most aspects of the movie. How is it going? As I wasn't able to release another part of VAGABUND last year, I have to say: bad. After all it's still just a hobby and to engage in a hobby you need enough spare time. When I have time then it goes well. Of course I have to do one thing at a time. Firstly, I do the in-game recordings with fraps. Next I cut everything short and search for the current voice recordings. Then I do my own video and voice recordings and last but not least I make the music. I then put everything together in the video-editing program and rearrange it until I'm satisfied. All in all that sounds like a lot of work. How much time have you invested in the movie so far? I don't know how much time I've already invested in this. I'm currently in the second year... But you're right: It's a lot of work. During the work and filming were there any funny or interesting moments you'd like to talk about? Well, the funniest things are the voice recordings of the in-game characters. I tried to include as many as possible of them. I already did this in 'Die Vergeltung' and laughed out loud while listening to them. It's interesting to work with current video technologies. The time I put into VAGABUND is very instructive for me - I like to 'learn by doing'. Do you have any advice for other movie makers, for example, how to deal with the cast members of the film, especially of different races? It's very difficult to deal with all the personalities on the set. A gun control point at the entrance is absolutely necessary and if a Split asks if a 1 metre blade is still considered as bread knife, he should definitely be denied entry onto the set. The best thing is to film every cast member individually to make sure that they don't meet each other on set. In the movie production you can then put all the parts together, so three cheers for technology! Still holding on to my college habits, I wake up rather late. First things for me to do are put on the kettle and turn on my PC. If everything goes to plan, I can sit down for breakfast just in time for the news headlines. Get my gear together and head off to the office. After moving to a new apartment last year, I've sold my car and basically walk everywhere now. The office is just 20 minutes away and it's a pretty nice walk past some fields and bunnies. This brief encounter with nature can cause me terrible hayfever though! Get into the office, right on time, never late... (I hope our project manager doesn't read this). I usually spend the first hour or so catching up with e-mails, updated code and the usual morning banter with the others in the office. I'm just about to get into the swing of things when someone cries, "Food?" Not only am I distracted by the idea of Pizza or Chinese, I'm also the 'order collector', running around putting together the food list and hassling people for money. My German language deficiency means I don't phone in the order myself. I usually have to pick someone to do that which can be the hardest part of my day! With the order placed, we all do what we can in the next half hour. I do spend quite a bit of time lurking on the forums. I've not got too much time lately to be as active as I'd like but I chime in every now and again. Things which usually catch my attention are Terran Conflict-related posts, such as complaints about how difficult the HUB plotline is (sorry about that :-p ). "Lunch time. It's usually spent watching something like the Daily Show but on occasion I fumble to test something while balancing Pizza, or try to respond to an e-mail without getting food on my keyboard." Refuelled and ready to go, it's time to put the headphones on and get cracking. My work can vary a lot throughout the day. My primary job is Mission Development which is scripting but I sometimes find myself programming in something I need. When working on missions, I get a good opportunity to do general game testing. It's something I still enjoy and it really takes up the majority of my time in-game. Sometimes it's easy to lose myself trying to track down a bug to make it easier on the person set to fix it but in the end it helps speed up the process and gives me better insights into how some things work. If I have something to 'commit' to the game, it's best to aim around this time, several hours before I leave. We don't want to commit something which causes problems for people. After committing my changes I usually sit very still and wait for the fallout. If 5 minutes pass without a "WTF! ", "Arrggh" or "Err, Owen? ", I'm usually in the clear. Time for a break. I take a look out the door to check on the weather. If it's not raining or windy I look to my left and mouth "Ping-pong". There sits BurnIt!, one of Egosoft's good ping-pong players (but you didn't hear it from me, right?). Some other contenders gather and head to the back garden to set up the table. I don't know if ping-pong is in the German school curriculum but some of these guys are great! I walk back to my desk, usually defeated. There's still a couple of hours left until I head home. If I've just finished a task I either start the next or take a look at bug reports I need to investigate or fix. Home time! I pack up and head back, usually going to the shop on the way. My usual fare when cooking is either some attempt at a curry or chilli con carne. I don't have much of a kitchen so I just bung a lot of stuff in a pot. If there's something to watch that night I usually grab a few beers too. At home I spend most of my time on my computer, mostly relaxing but still lurking on the forum and waiting for new e-mails. More often than not, I put on my Xbox or Gamecube for a bit of gaming. If it's not too late, I'll give some of my family a call or go on Skype and facebook. One final pass over my favourite pages and then I put on something short to watch before bed. I put on another episode and immediately regret the decision. If I'm able to stay awake, I shut everything down and call it a night. I make the usual promise to start going to bed earlier, then nod off. Copyright © 2011 Egosoft GmbH, All rights reserved.